This article, from The San Francisco Call, Sunday, 11-March-1906, just over a month before the Earthquake and Fire, tells the story of Michael Houlihan, who drove the United Railroad's franchise-holding horse car line on California Street. Learn more about horse cars in an article about their 175th birthday. "HOULIHAN is back at work." There were broad smiles on the visages of the habitues of California, street last Tuesday morning when this bit of news was spread along the street, carried on and on by the policemen, the truck-men. the porters, clerks and even the merchants, who are interested in the welfare of Michael Houlihan. And sure enough there was Houlihan, in his accustomed place behind the dashboard of the only horse car that daily moves slowly up and down California street, seemingly for no more laudable purpose than to make fame for its driver -- a man who is as widely known in the finnancial center of San Francisco as the wealthiest of the metropolis' bankers. With his gloved left hand firmly gripping the reins of his two horses and his right hand fastened tightly to the brake handle, Michael Houlihan, with a beaming countenance, bowed acknowledgment to the salutations given him as his car proceeded down the street on its way to the ferry that morning, stopping occasionally to drop a passenger. Without Michael Houlihan and his antiquated car California street would be minus one of the most interesting relics of the village period of San Francisco. For more than thirty years this sturdy Irish-American has had but one vocation, that of standing at the fore end of a horse car where he has studied human nature in his own peculiar way. For eighteen years of that time -- it was November 1, 1888, that he first started on the California-street run -- he has been traveling through the lower portion of that street, from Montgomery eastward to Market, and then to the ferries and back, never missing a day at work, with one exception, until a recent illness kept him at home for four weeks. It was his return to work Tuesday morning that caused the commotion on California street and so strongly emphasized the fact that Houlihan had been missed along his accustomed route of travel. As the only representative on California street of the California Street Horse Car Company -- a corporation whose principal assets are Houlihan's popularity and a car and two horses -- he has gained a distinction for himself that few men in the street railroad service can boast of. Practically Houlihan is everything of an official character in connection with the company by which he is employed -- and it is doubtful if more than half a dozen of the men engaged in business on California street could have told you how this interesting Irishman and his ancient car came to be in that modern portion of San Francisco. In the course of his long career on that street Houlihan has made an acquaintance that includes the most prominent of the city's financiers, insurance men, brokers, commission men and storekeepers, with whom he is always exchanging a greeting or a few witty words as they climb aboard his car on their way to their places of business in the morning or homeward bound from their offices in the afternoon. In only one respect does Houlihan keep pace with the moneyed men of the street. He, like the majority of them, begins his labors at 8 o'clock in the morning and quits at 5 o'clock in the evening. Although a plebeian professed, he is really an aristocrat in his own class, enjoying life as it comes and ever looking philosophically into the future. "What's the use worrying about everything," he remarked to me as I boarded his car Tuesday and quietly engaged him in conversation. "Life to most of us is just as we experience it on this car. For a time everything is clear before you and then some big truck or other obstacle gets on the track and everything goes wrong. It's no use hollering your head off, for the man in front won't hurry any more. The best thing is to pull your reins up tightly on the rail and get off and help the fellow out of your way with his heavy burden." The traffic of Houlihan's car is by no means heavy. He makes thirty-two runs between Montgomery street and the ferries every day, but probably does not carry more than fifty passengers on all of them. Those that do ride with him do so because they like the driver and have ridden with him so long that it has become a portion of their life. It is part of their daily exercise to get into the rickety old car as it stands on the siding at the corner of Montgomery and California streets and patiently await the pleasure of Houlihan to start on his eastward trip. A loud "gid-dap" from the driver and the whirring of his brake as it is suddenly loosened by Houlihan reminds the passenger that his journey has begun. The car lurches and creaks as it slowly moves forward to the main track of California street, and the rattling of its windows and the twisting of its hardwood seats tells you when it is passing over the steel frog to the heavier rails of the more modern roadbed. 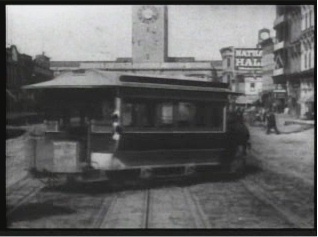 Usually Houlihan's car trails down the street behind the cable car, thus giving the latter a freer right of way and lessening the work of clearing the route of the heavy teams, whose drivers are not disposed to so readily heed the jingling of the horsecar bell as they usually do the clanging of the big gong on the larger car. "Yes, there are better jobs in store for mankind than this," he said as our conversation proceeded, "but the Lord has been good to me in mine and I have lived along contentedly. If I was going to live over --"
"Hey, there! What's the matter with you?" suddenly shouted my new-made acquaintance as he hurriedly wound up his brake and reined in his horses directly behind a small wagon that had turned unexpectedly on the track right in his way. "Come now, get along, get along there. It's valuable time you're taking up." And the offending driver of the wagon, apparently appreciating Houlihan's right of way and understanding his well-meaning words, whanged his horse on the back and was soon off the track. "Michael Houlihan and his Antiquated Car" -- Himself. "Gid-dap," muttered Houlihan, and his horses moved forward again as he loosened his brake and slackened his reins. "Yes, sir." he resumed, "If I were going to live over my life I don't think I would take to driving horse cars. Still, I have no great reason to complain. I'm used to the work, have been fairly well paid -- well enough, at least, to rear and keep a respectable family -- and I still have my health after facing for so many years the worst of the San Francisco storms on the front of this old car." Michael Houlihan's career as a car driver dates back to the early part of 1876, when he was engaged on the North Beach and Mission line and where he remained until San Francisco's pioneer horse car line passed to the control of the old Market Street Railway Company. Then he was assigned to a car on the Folsom street branch, remaining, there quite a time until again transferred, this time to the old Kearny street line. He was there but a few days when the work of transforming the road to an electric. 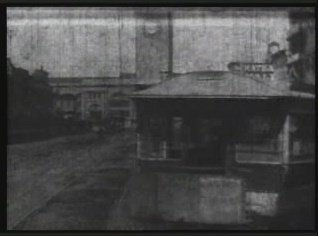 line began, and again Houlihan was moved to the Sixth street horse car line. His next job was on the Fifth street line, and, finally, when progress began to eliminate the old style cars from the main sources of travel Houlihan was given his present position on California street. He was inherited by the United Railroads from the old Market Street Company, and having a clear record he was selected to remain with a single car on California street as the only representative, as already stated, of what is known to but few as the California Street Horse Car Company. Somewhere in the dim past the street-railway magnates secured a right of way along California street, east of Kearny, and decided to hold their possession against a possible extension of the California Street Cable Company's line from Kearny eastward to the ferries. 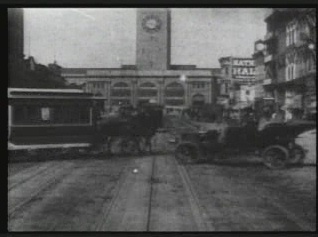 Eventually the latter company did extend its cable system to the foot of California street, but only by an agreement with the California Horse Car Company. As a matter of fact the operating of a lonely horse car on the lower part of California street today is to preserve the company's rights under a charter and that is why Houlihan is there. But it is not the affairs of the company which he represents or the causes that keep him working so faithfully there that I have in mind. It is the quaintness of the service he manages, of which he is an enjoyable part. Until a few months ago Houlihan's car was one of the old bob-tailed sort, with all the equipment of the time when that car was the popular and in fact only mode of public transportation in San Francisco. Several months ago this ancient car passed its day of usefulness and apparently with a view of perpetuating its memory another old car was placed at the disposal of Houlihan. It differs but little in ancient style to its predecessor except that it is drawn by two horses instead of one. "Michael Houlihan and his Antiquated Car" -- the car. In the same old-fashioned way the driver on reaching his terminals unhooks his horses from the car end and drives them around to the other end, and he maintains the same old custom of collecting fare through the medium of a cashbox stationed in the forward part of the car in which a dingy mirror reflects the coin as it is dropped into the box, thus permitting the driver to guard against the use of counterfeits and to properly count the number of fares as the trip progresses. Then, too, there is the old swinging brass plate in the car door, through which, the passenger passes his "quarter" or larger piece of money for change before depositing his fare in the adjoining box. 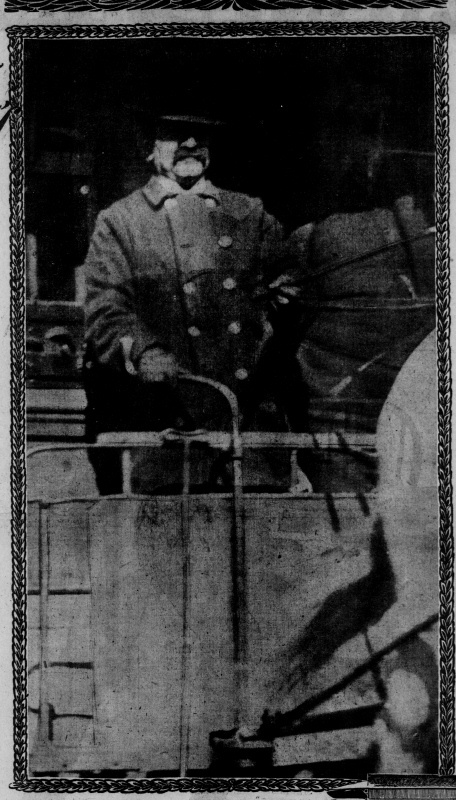 It is an interesting picture to see Driver Houlihan jingling the bell in his coin receptacle to remind some derelict passenger of his forgetfulness, and when failing to attract his attention to open his door and yell "fare, please," just as they were in the habit of doing twenty years ago on the old lines of horsecars. Again does Houlihan revive memories of the past when a passenger in want of change passes to him through the door a piece of money. Placing the coin, between his teeth he takes a firmer hold, on his reins with his left hand while his right digs down into his trousers pocket for the change, and when it is made and the fare is deposited tne driver's attention is again turned to his horses and the road before him, along which he bids the animals to hasten with his familiar "gid-dap," the same old "gid-dap" that the carmen shouted in the good old days when the pattering of the car horses' hoofs on the hard street pavement lulled citizens to sleep at night. A strong sentiment of pride is ever noticeable in the character of Houlihan. It is not a boasted pride, for he is as modest as his position in life. While, as he has said, he might have done better at the beginning of his career he is, no longer regretful and having cast his lot he has striven to do the best he can. "It's trying at times," said he, as his mind seemed to revert to the past, fraught with its hardships, during his stewardship of the affairs of the railroad company, on California street, "to please everybody all the time, but I feel that I have offended few, and none intentionally. Many of those who, years ago, were wont to greet me in the morning or say a kind goodnight, have passed to their lasting rest. And many a day in the years that I have been on Californla street have I seen the flag raised on the pole over the old Merchants' Exchange building to half mast and later I learned that it was in respect to some one of those generous old men who had died. "And do you know," he remarked in a low, voice, "I have often been prompted to bow my head and offer a few words of prayer for the peace of their souls." Those that have not passed away are still riding with Houlihan and much comfort he finds in their "Morning, Houlihan" and the talks they indulge in with him. "They ride with me on the front platform," said he, "and tell me the news of the day, keeping my mind out of the rut and, making me feel that the world is not as cold as some of us think it is." And even as Houlihan spoke his car, then just turning into Californla street from Market, was hailed by one of the capitalists of the money center, who jumped aboard and greeted the smiling driver with a "Hello, Houlihan; so you're back again? Good, we were wondering what had become of you." Slipping his fare into the box the passenger settled down on a seat, prepared to patiently endure the slow trip up California street to Montgomery. "There's a fine gentleman," said Houlihan in an undertone; "he's a fair sampie of the elegant men that I have to deal with on my runs. He rides every day; never kicks and always has a kind word for me. Is it a wonder that a man does not tire of his job, when it is pleasant as this one? "There now," he continued, addressing his horses, "quit your skylarking. None of that prancing, for we're not going to hurry this trip. Stop it," and the tone of Houlihan's voice apparently impressed the animals with his authority, which they were wont to recognize and respect. Arriving at the Montgomery-street terminus several of Houlihan's old friends on the street were there to wish him a welcome back on California street, and one old timer, a member of one of Sansome street's biggest commercial firms, who counts Houlihan among his friends in business life, grabbed the driver's hand and shook it in a way that plainly told of the regard he had for the stocky little man. I have mentioned, the fact that during his career on the California street car Houlihan had never missed a day at work with one exception, until his illness. That particular exception stands out boldly on his record card in the office of the United Railroads, and strangely, too, it is pointed to by the executive officials of the corporation as evidence of his faithful service. Upon the face of his card, where the date of his first day's service on California streeet is duly recorded as November 1, 1888, there appears his name, his nativity and the words "family of six." Beneath these words, under the caption of "previous occupation" is written "railroading" -- practically the story of Houlihan's career. They might have referred to some disastrous affair where life and limb were concerned; a collision as a result of ignoring Instructions, entailing loss of property to the company or its patrons, or the words might have appeared a dozen times in such a long career, but in Houlihan's case they are written only once, and long ago. "I lost one of my buttons, said Houlihan, "and I took the other one off until I had purchased a new cap. The superintendent of the Sutter-street road, to whom I had been ordered to report when the new management took charge, called my attention to the absence of the buttons. I explained to him my intention of buying a new cap and forgot the incident until several days later, when he sent for me, and when I appeared at his office he told me that I could not go to work until I had got my buttons. I had to go to Manager Chapman's office, and that is how I missed my run that day. And, say, Mr. Chapman is a fine man. When he heard that I had suddenly got into trouble over such a small affair he at once helped me out of my fix and made me feel that I had not committed such an awful offense as it had at first seemed." -- But it was always so with Houlihan. In the years that he served so faithfully on the various car systems of San Francisco he always had the respect of his employers and enjoyed the good will of the traveling public. "It is the little things that a man does," remarked he, "that either make or break him. Being a man of family I always had a kind feeling for the mother with her little tots who wanted to board my car and I tried to stop so that she would not be inconvenienced unnecessarily in getting aboard. In the winter time I would see that my passengers, especially the women, were afforded a dry spot on which to alight, and sometimes I disregarded the rules of the company just far enough to make it possible for some old and crippled man to reach the car without walking too far. They were little things, it is true, but they brought to me good reward in the gratitude of those people with whom I daily came in contact. 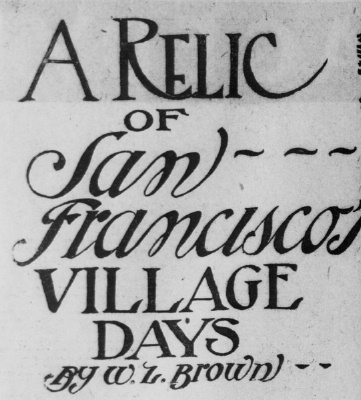 "There are many of the people of San Francisco who rejoiced at the advent of the more modern streetcar service, but I'll wager that many of them can look back to those old days and remember when they received more consideration from the horse car driver than Is afforded them today by the gripman and the motorman -- not that I desire to reflect any discredit on the latter, but times have changed in San Francisco. In those days the public, was not thinking of a fast service. They knew that a horse's pulling power was just so much and they made ample allowance for the many unexpected interruptions that were encountered on a trip on one of the horse cars. Since then the world is clamoring for faster and faster service. The electric car picks them up and hurries them along, and if it is unexpectedly delayed it makes up the time by using a little more electric force, and the destination of the traveler Is reached within the time he expected. "But where the public has been benefited the poor carman has suffered. Today it is his lot to stand all kinds of abuse that thoughtless passengers heap upon him when the service does not please them and he is constantly burdened with responsibilities that fairly rack his nerves. He can't get away from the kicks that are registered against him and if it wasn't for the fact that the company's officials have by experience learned to carefully weigh these complaints his life would be most miserable. A dozen years' service would find him passed beyond his life of usefulness. In the old days the driver of the bob-tall car was alone on his platform, which was sacred ground unless he saw fit to admit some one there, and the chronic kickers had a hard time annoying him. When one of those fellows started to make a rumpus over some trivial thing we would just stir up the old horse and keep the car going, never looking, around until the car, bell signaled a stop or some one hailed us at a crossing." Driver Houlihan bears the good will of all the carmen, and also has the distinction of being the last man to be called off his car during the big railroad strike. He lives with his "family of six" in the aristocratic portion of Shipley street, stands on the city's records as a property owner in a modest way, has no cares to worry him beyond his car and his home, knows no enemies, covets no other man's enjoyments, is hale and hearty after his recent sick spell, and is hopeful of living until the last of the old horse cars, along with his, have passed beyond the recollection of San Francisco's citizens. How long that will be is a matter of speculation, but his hopes are shared by the devoted members of his family, and, if the truth be told, by scores of men along California street, who will regret the day when Michael Houlihan turns his antiquated car into the stable for the last time and returns to private life in his comfortable home on Shipley street. Horsecar service on California Street began in 1865 when the North Beach & Mission placed trackage on that street from Battery to Montgomery. 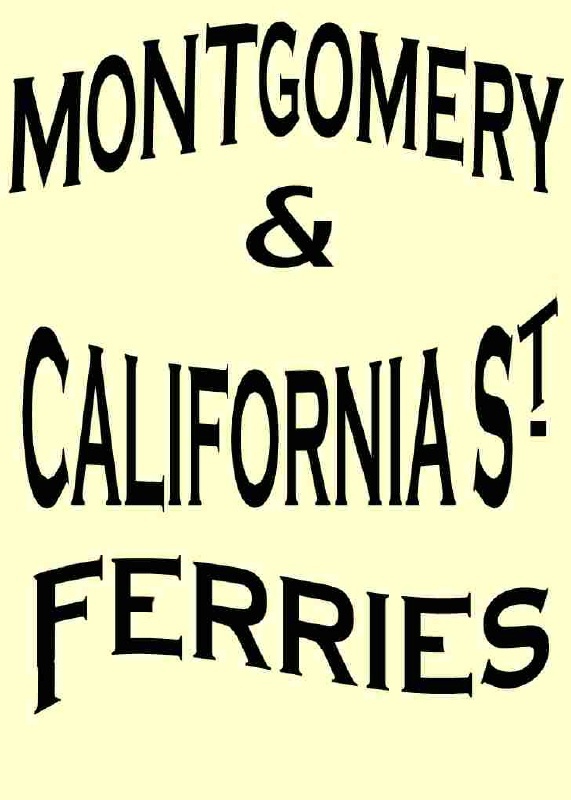 This trackage was later extended on both ends to run from Drumm (Market Street) to Kearny and incorporated into the NB&M�s Eighth & Folsom line that ran from the Ferry, up California to Kearny, down Kearny to Market, out Market to Eighth Street, down Eighth Street to Folsom, and out Folsom to 26th Street. In 1891 a deal was struck between the NB&M (now under Omnibus control) and the California Street Cable Railroad which allowed that company to extend its cable line east from Kearny Street to Drumm Street. Cal Cable purchased operating rights from the NB&M. The NB&M received an additional source of needed revenues. Since most of the NB&M passengers had origins or destinations beyond Kearny Street and California, NB&M management felt they had very little to lose by sharing their franchise with Cal Cable. State law allowed companies to use the franchise of another operator for a distance of up to five blocks. This would be a six-block extension. Thus began an unusual three-rail operation on California Street. The 3'6" gauge cable car line shared a running rail with the 5' gauge horsecar. In 1893 the Eighth & Folsom horsecar was rerouted directly down Market Street to the Ferry, thus creating Michael Houlihan�s line, the franchise operation on California Street that was to exist until the April 18, 1906 Earthquake and Fire. Electric lines under the Market Street Railway (of 1893) replaced horsecars on Kearny, Eighth and Folsom. Val Lupiz made this reproduction of the dash sign which graced Michael Houlihan's car. 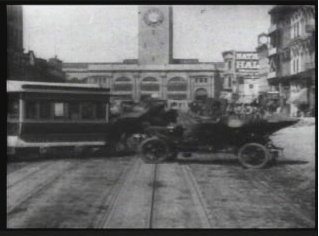 Val Lupiz pointed out to me that a horse car which dashes into Market Street towards the end of the 1905 movie "A Trip Down Market Street" must be Michael Houlihan and his car. Below are a few screen shots.